Victims of the Griffith Park Fire receiving first aid, October 1933. 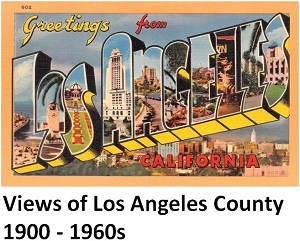 Photo from UCLA Library Digital Collections, Los Angeles Times Photographic Archive. The Griffith Park Fire of 1933 (not listed in the table above) is considered the third deadliest firefighter tragedy in U.S. history (after the September 11 attacks and the Great Fire of 1910). On October 3, 1933, 29 men were reported killed as they tried to fight a wildfire that flared up in Griffith Park’s Mineral Wells Canyon. The men were among more than 3,700 workers recruited at 40 cents per hour (enough that year to equal the value of a new home after a year of full-time wages) who started the day doing brush clearance and construction projects in the park. Temperatures had reached 100 degrees Fahrenheit by noon. When a small brush fire ignited sometime after 2 p.m. that afternoon, supervisors thought that, with so much manpower available, they could order or convince enough men (desperate to keep their jobs) to switch to switch to firefighting, but, with no adequate water supply available, they had little more than shovels with which to fight the fire. Neither workers nor crew bosses were trained firefighters. Although Los Angeles Fire Department crews arrived within a half hour, they were impeded by the throngs of untrained firefighting workers. To make matters worse, workers were dangerously being ordered by bosses into burning Mineral Wells Canyon and Dam Canyon. Suddenly, about 3 p.m., winds that earlier gently blew down the canyons reversed and shifted the fire against the men. Men scrambled to outrun fast moving flames (moving at 20 miles per hour). Some were quickly overtaken and burned to death. In Dam Canyon, men found themselves surrounded by flames with few options for escape. Survivors described scenes and sounds of horror. By nightfall, after burning 47 acres of the park, the fire was finally brought under control by evening. 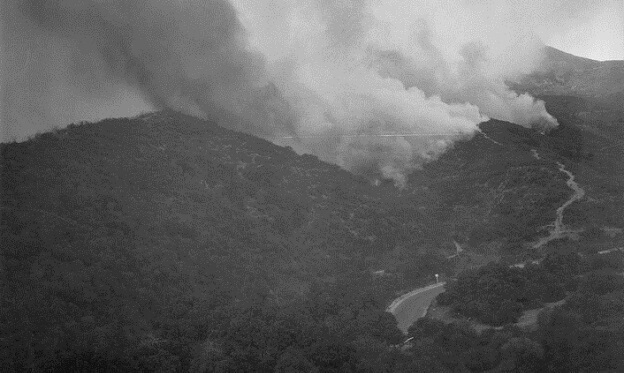 Columns of smoke rising from the Griffith Park Fire, October 1933. Photo from UCLA Library Digital Collections, Los Angeles Times Photographic Archive. In the aftermath, it proved difficult to identify the actual number of victims due to lackadaisical organization and recordkeeping (and some alleged corruption) by project managers and timekeepers. More than a month after the fire, the Los Angeles County District Attorney finally established the death toll at 29, but others (accusing authorities of trying to minimize the death toll) maintained the number to be as high as 58. Read more at The Fire of ’33.